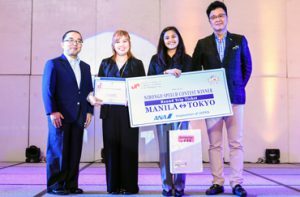 The Japan Foundation, Manila (JFM) in pursuit of its objective of promoting cultural exchange through Japanese Language Education in the Philippines, announces the Nihongo Speech Contest 2018 to be held on Saturday, 17 February (tentative – Shangri-La Plaza Mall, EDSA, Mandaluyong City). The speech contest, now in its 45th year, is one of the major events of the 13th Nihongo Fiesta which will feature live performances, Nihongo Quiz Bee, film showing and a lot more activities on Japanese culture. The Nihongo Speech Contest is an ideal platform for Filipino students and professionals to demonstrate their linguistic skills through articulating an original composition written by themselves on a theme of their choice. It continues to attract high caliber contestants from the country’s numerous language institutes, colleges/universities and other organizations offering Japanese language courses. The Champion will take part in an all-expense-paid week-long study tour in Japan; all qualified contestants will receive consolation prizes. The deadline for submission to the Japan Foundation, Manila (JFM) of the duly accomplished application form with a written copy and a recording of the speech (time limit – within 5 minutes) will be on Wednesday – 10 January 2018 for Davao/Mindanao applicants; and, Wednesday – 31 January 2018 for NCR / Luzon applicants. Pre-screening in Davao is scheduled on Friday – 19 January 2018 (1:00 p.m., Mindanao Kokusai Daigaku (MKD Audio-Visual Room), Angliongto Ave., Lanang, Davao City; and, at the JFM on Saturday – 3 February 2018. In consonance with the promotion of Japanese Language Education, a similar event will be held in Cebu City that will also serve as the regional pre-screening for the Final National Contest in Manila. The 16th Nihongo Speech Contest in Cebu will be held on Saturday- 3 February 2018 (tentatively at SM Conference Room AB, Cebu City) for inquiries on the submission of entries and other details, please contact the Japanese Association Cebu, Inc., 5/F Clotilde Commercial Center, M.L. Quezon St., Casuntingan, Mandaue City; tel. # 032-343-8066 / fax # 032-343-7663).